Today’s story in our World War I Centennial series is written by Darrell Dorgan, a documentary film producer from Bismarck who is an Emmy-nominated and award-winning journalist and chairs the North Dakota World War I Centennial Commission. Shell shock was the World War I version of today’s Post Traumatic Stress Disorder. Millions died in the carnage that began in Europe in 1914. By 1917, the slaughter was at a stalemate, and the United States was drawn into the conflict. Nationwide, millions stepped forward to fight. In North Dakota, 30,000 put on the uniform, picked up the rifle. Poignantly, many here who volunteered weren’t even citizens. They were simply homesteaders, immigrants who were determined to be part of the American Dream and were willing to pay the price. Hundreds more were American Indians who had already lost nearly everything. They once again became warriors and fought for a country, that even in 1917 refused them citizenship. 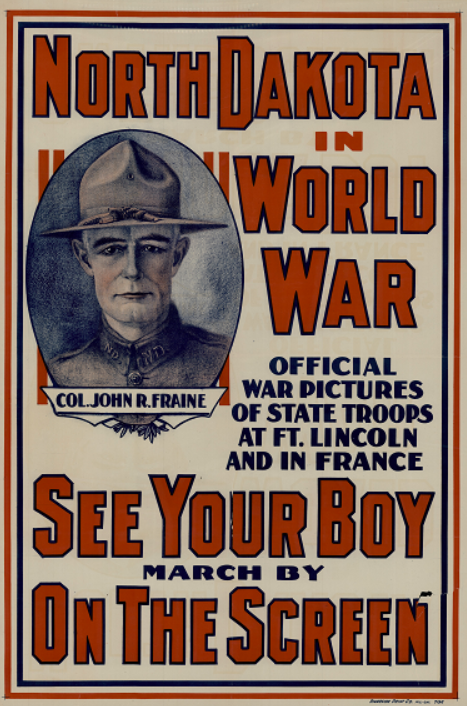 Nationally, more than 117,000 young men died, most within a six-month period in early 1918. More than 1,300 of the dead were from North Dakota. Thousands more like Ed became walking wounded. The veterans of World War I were American heroes. But today, a century after they entered the trenches, their sacrifices have been largely forgotten. That’s why nationally, and in North Dakota, we are marking the Centennial. People need to remember the sacrifices that were made, the price that was paid for freedom, liberty, democracy. Imagine the pandemonium today if more than 117,000 young American men were killed in less than a year. If 1,300 of the dead were your neighbors, relatives. We’re still paying the price of World War I. Germany, the Ottoman Empire, the Hapsburg Empire, were on the losing side. Their boundaries were dramatically changed, they were stripped of colonies and the Treaty of Versailles would lead to World War II just 20 years later. Many of the countries in turmoil today are the result of lines drawn creating new countries following World War I. Iran, Iraq, Jordan, Syria, Romania, Serbia — all were creations of the victors of World War I. Many, where we are fighting today, were created without thought to tribal, economic, religious or geographic boundaries. The price is still being paid. We were asked by the United States World War I Centennial Commission to form a World War I Centennial Committee in North Dakota earlier this year. We quickly needed to bring the story to life so people across the state and school kids could carry forward the story that began 100 years ago and continues today. The North Dakota Newspaper Association stepped up to the plate and agreed to publish a series of stories about World War I and its impact on North Dakota. We needed computer expertise to compile the list of names and hometowns of those who served and died. I was naive enough to text Gov. Doug Burgum on a Saturday night and ask for help. He immediately texted back and said some friends who are technical experts would call within 15 minutes. They not only adapted a program to create the list, they also created and maintain our website — ww1cc.org/nd. The State Historical Society of North Dakota also immediately stepped forward and planned new exhibits and educational materials. So have veterans’ groups. Now in this series you can read with amazement a story that happened in your backyard and across the world a century ago. I’ll bet that, when you’re done talking to friends and neighbors, you’ll find there was an Ed in your town, or family, too. Thank you for your efforts. My grandfather served in France before coming home to marry the his sweetheart. One of his great granddaughters, whose husband is presently stationed there, represented him in a memorial in France this year, reading from the diary that he kept while in the war. Europe does a great deal more to pay tribute.